Published: Feb 4, 2019 · Modified: Apr 11, 2019 · By Jen Sobjack · This post may contain affiliate links. 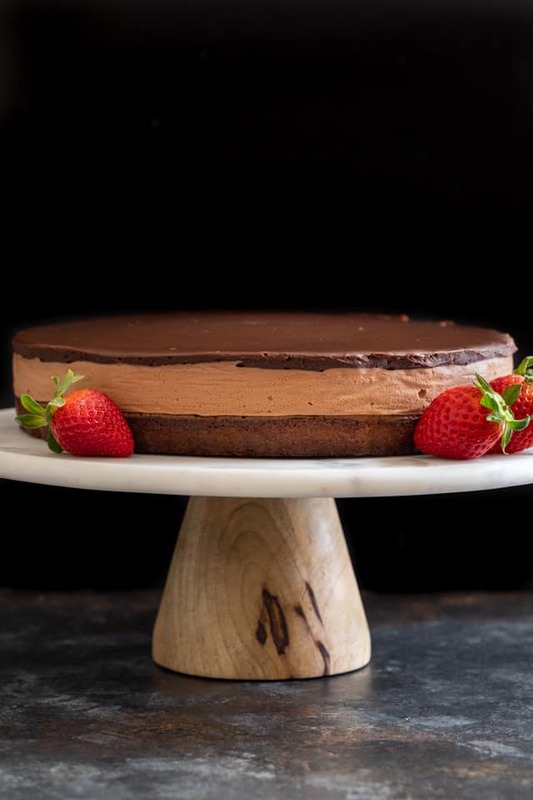 This triple Nutella mousse cake features a rich Nutella brownie base topped with a layer of luscious Nutella mousse filling and a layer of soft Nutella ganache. Over the years I’ve created some pretty amazing desserts and today’s recipe is no exception. The cake you see here is the love child of my Nutella cheesecake and triple chocolate mousse cake. Valentine’s Day is just a few weeks away and I knew we needed to celebrate with something special. 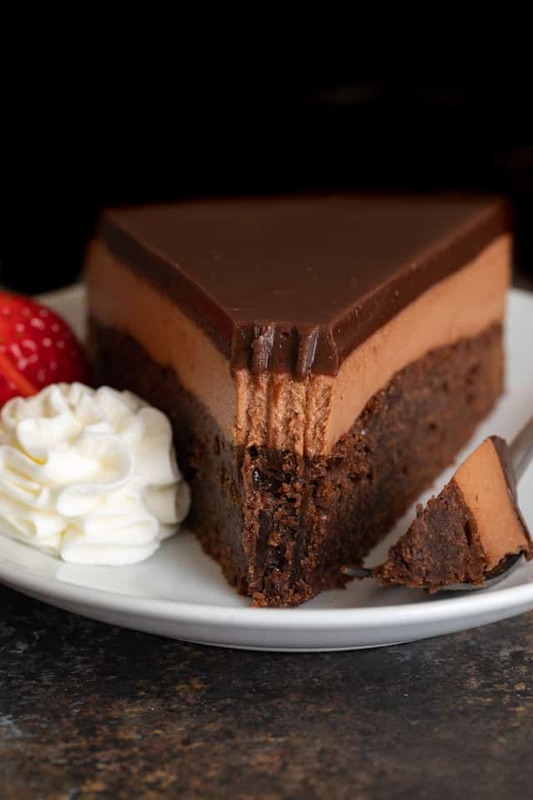 This TRIPLE Nutella mousse cake is just that. It sounds like it would be overly sweet but trust me, it’s not. The base is my Nutella brownie recipe. You guys love that one! I used a little less sugar so the brownie isn’t quite as sweet but still just as decadent and amazing. The brownie base is topped with a lush mousse made with Nutella, cream, and gelatin. I also added a pinch of salt to help balance the sweetness. The cake is then topped with a super soft Nutella ganache. It’s soft even after being refrigerated! You are going to really like this one, I promise! 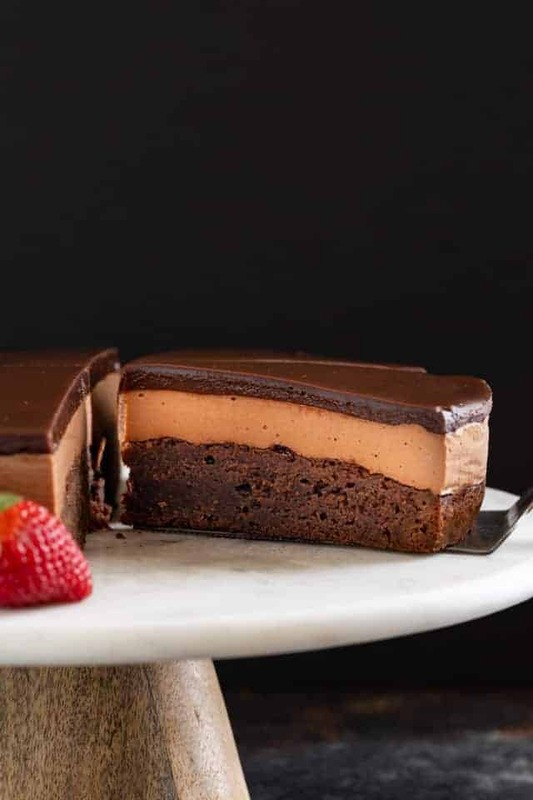 How to make triple Nutella mousse cake? Begin by making the brownie layer. Line the bottom of a 9-inch springform pan with foil so the cake is easy to lift off the base of the pan. You could also use parchment paper but I worry about batter leaking from the bottom seal. Spray the foil and sides of the pan with non-stick spray and press a strip of parchment paper around the inner ring. The nonstick spray will help the parchment paper stay in place. 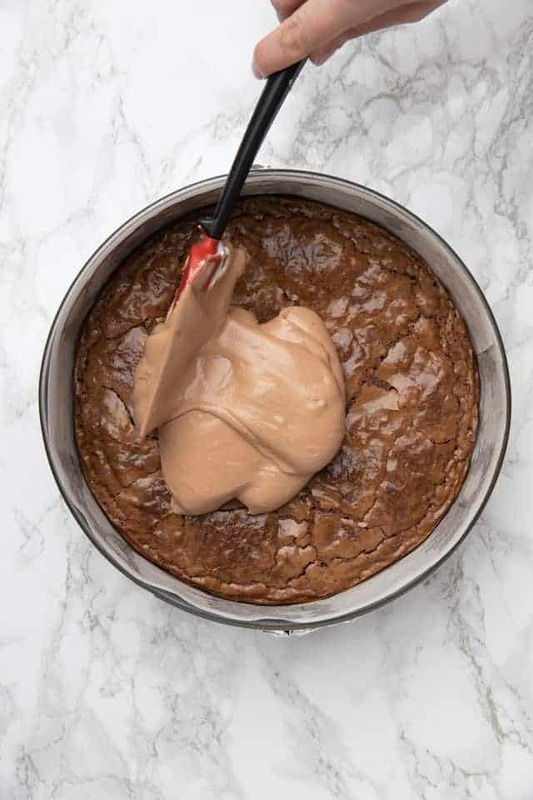 Prepare the brownie batter then spread it evenly into the bottom of the pan and bake it for 25-30 minutes. Times may vary depending on your oven. Test the brownie with a toothpick and remove it once you get just a few moist crumbs attached to the toothpick. Cool the brownie completely by letting sit at room temperature for an hour or refrigerate it for about 20 minutes. Once the brownie base is completely cool, you can make the mousse layer and spread it over the brownie layer. Refrigerate the mousse layered brownie for at least 2 hours. After the mousse layer has set, make the ganache topping and spread it evenly over the top. Return the cake to the refrigerator and chill for about 1 hour to allow the ganache to set. Remove the sides of the pan and carefully pull the parchment paper off the sides of the cake. Transfer the cake to a serving platter and enjoy! Do I have to use gelatin for Nutella mousse? For the cake to hold its shape, you must use the gelatin. It keeps the mousse layer sturdy and prevents it from “melting” off the brownie layer. 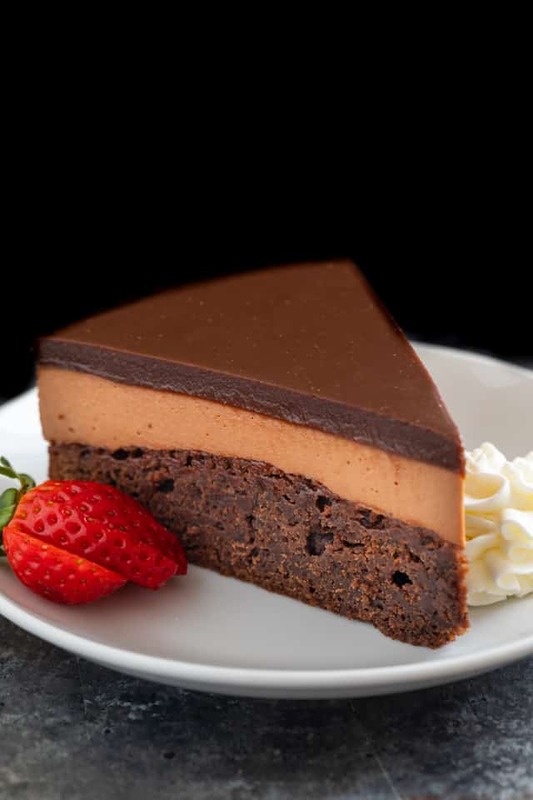 Can I make Nutella mousse cake with boxed brownies? You certainly can! Just prepare the batter as directed and bake it in a 9-inch springform pan. When you make the mousse filling you’ll need to let the warm Nutella and gelatin cool before adding the whipped cream. During the cooling process, it is VERY important that you stir the Nutella mixture frequently. If you fail to do this you may end up with tiny little gelatin balls throughout the mousse. You can underbake the brownie base slightly if you want a fudgy texture! When you go to serve the cake, slice it while it’s cold then let the slices come to room temperature for the best texture. Preheat the oven to 350ºF. Line the bottom a 9-inch springform pan with aluminum foil and spray the foil lightly with nonstick spray. Line the sides of the pan with parchment paper. Add the Nutella and butter to a medium saucepan. Warm over medium-low heat, stirring constantly until Nutella is melty and smooth. Whisk in the sugar. Set aside to cool slightly. Once cooled, whisk in the eggs and vanilla until combined. Sift the flour, cocoa powder, and salt into the Nutella mixture and fold together with a rubber spatula just until combined. Spread the batter evenly into the bottom of the prepared pan. Bake for 25 to 30 minutes, or until a toothpick inserted into the center comes out with only a few moist crumbs. Leave the brownie in the pan and set it wire rack to cool completely. Or pop it in the refrigerator for 15-20 minutes. In a small bowl, sprinkle the gelatin over water, let stand for 5 minutes. 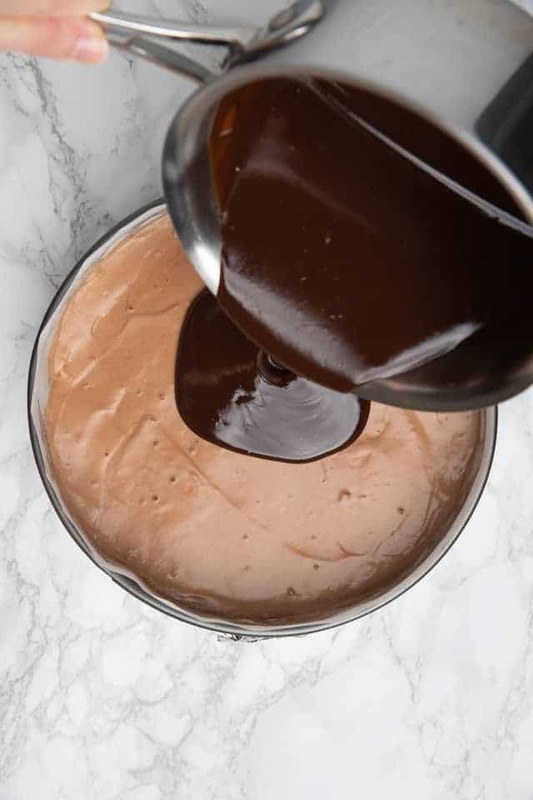 Bring the Nutella and 1/2 cup of the cream to a simmer in a small saucepan over medium-high heat, whisking until the Nutella has fully melted. Remove from heat. Add the salt and softened gelatin; whisk until gelatin is fully dissolved. Transfer to a large bowl and cool to room temperature, stirring occasionally. The mixture will thicken slightly. Use a whisk to mix in 1/3 of the whipped cream into the Nutella mixture. Use a rubber spatula to fold in the remaining whipped cream until no streaks appear. Spoon the mousse into the pan over the brownie layer. Smooth the top with an offset spatula. Place the cake in the refrigerator and chill until set, about 2 hours. Warm the Nutella and cream in a small saucepan over medium-low heat, whisking until the Nutella has fully melted. Set aside to cool for 10 minutes, stir it occasionally. Pour the glaze over the top of the mousse layer and use an offset spatula to smooth it over. Refrigerate for at least 1 hour or until the glaze has set. Carefully remove the sides of the pan and dispose of the parchment paper. Serve the cake with whipped cream or fresh berries. The cake can be frozen for up to 3 months. Thaw in the refrigerator overnight before serving. It’s important to let the ganache cool before topping the mousse with it. If you pour warm ganache over the cold mousse, you’ll get condensation which will seep from the crack where they meet. How much of this can I make ahead? I was going to make the brownies on Thursday, the mousse on Friday, and the ganache on Saturday and put together Saturday afternoon/evening. Can the mousse be made a day ahead??? I think I found the answer, but is it better if I don’t put it together until last minute? Or put together the night before and keep in fridge? Thanks again! The brownie can be made a day before you add the mousse and ganache. But the mousse and the ganache can’t be made until you are ready to add them to the cake because both layers will set upon refrigeration. The entire cake can be made and kept refrigerated for up to 3 days. This looks delicious, I’m excited to try it! But first I have a question: the ingredients for the brownie base says “granulated sugar” but then the instructions say “brown sugar.” Which one is it? Oooo! This is my new favorite EVERYTHING! It’s all I want for Valentine’s Day! 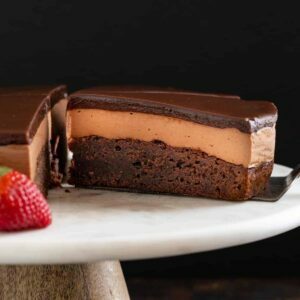 This is the most amazing Nutella mousse cake I’ve tried!